How the use the Alcohol Tester? 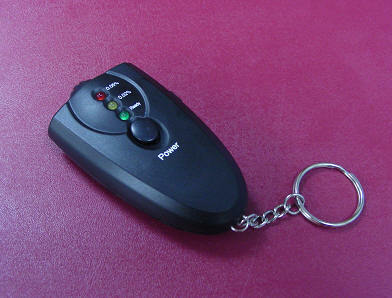 1) Press and hold the power button to turn on the alcohol tester. The Yellow & Red LEDs will light up that indicate warming-up. 2) Press and hold the POWER button until the Green LED light up for finish warm-up. 3) Please hold the POWER button until finished the whole test. *The warm-up time is about 0-15 seconds, and it is optional depended the sensor status or environment. * It always has a large number of gas & impurity adsorbed on the surface of alcohol sensor, when first time taking out the tester from the packaging, or after long time no using for the tester, it need more time for cleaning and warm up the sensor. You should repress the power button and retry several times if possible. from the digestive organs, and residual alcohol remaining in the mouth takes this long go dissipate. - For accurate result, do not repeat next testing with 3 minutes after last time. - Do not smoke and eat for 20 minutes prior testing. - Do not use chemicals to clean the tester directly. - Do not blowing liquid into the breath pipe. - Do not use any excicant substances near the tester, such as pains, insecticides, alcohols. - Do not place the tester in the closed environment with contaminated air. - The result of this alcohol gives BAC for reference only. We do not to take any legal responsibility.